NASA's New Horizons spacecraft has begun its long-awaited, historic encounter with Pluto, entering the first of several approach phases that will culminate with the first close-up flyby of the Pluto system six months from now. New Horizons launched in January 2006 and, after a voyage of more than 3 billion miles, will soar close to Pluto, inside the orbits of its five known moons, this July 14. The fastest spacecraft ever launched, New Horizons awoke from its final hibernation period in early December. Since then, the mission’s science, engineering and spacecraft operations teams have configured the piano-sized probe for distant observations of the Pluto system, starting with a long-range photo shoot that begins Jan. 25. “We’ve completed the longest journey any craft has flown from Earth to reach its primary target, and we are ready to begin exploring!” said Alan Stern, New Horizons principal investigator from Southwest Research Institute in Boulder, Colo.
APL manages the New Horizons mission for NASA’s Science Mission Directorate in Washington. Alan Stern, of the Southwest Research Institute (SwRI), headquartered in San Antonio, is the principal investigator and leads the mission. SwRI leads the science team, payload operations, and encounter science planning. New Horizons is part of the New Frontiers Program managed by NASA's Marshall Space Flight Center in Huntsville, Alabama. APL designed, built and operates the spacecraft. New Horizons is the first mission to Pluto and the Kuiper Belt of icy, rocky mini-worlds on the solar system’s outer frontier. This animation follows the New Horizons spacecraft as leaves Earth after its January 2006 launch, through a gravity-assist flyby of Jupiter in February 2007, to the encounter with Pluto and its moons in summer 2015. 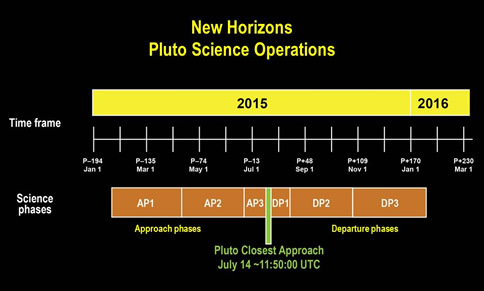 Timeline of the approach and departure phases – surrounding close approach on July 14, 2015 – of the New Horizons Pluto encounter.